Apple goes from near bankruptcy in 1997 to a trillion dollar market cap in 2018, what a run! The market has been buzzing about Apple’s $1 trillion market valuation. 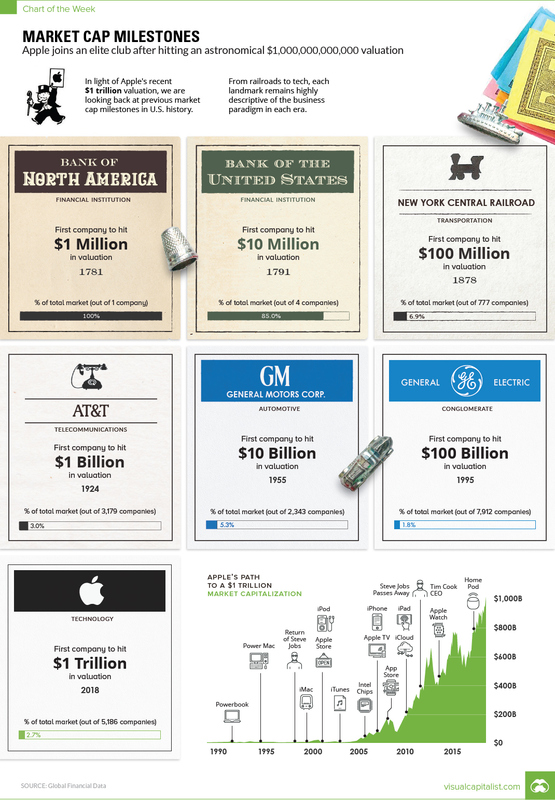 It’s an incredible amount of wealth creation in any context – but, as Visual Capitalist’s Jeff Desjardins notes, getting to 12 zeros is especially impressive when you consider that Apple was just 90 days from declaring bankruptcy in 1997. The first company to hit $1 million in market capitalization. It was the first ever IPO in the United States. The first company to hit $10 million in market capitalization had a 20 year charter to start, and was championed by Alexander Hamilton. The first company to hit $100 million in market capitalization was a crucial railroad that connected New York City, Chicago, Boston, and St. Louis. The first company to hit $1 billion in market capitalization – this was far before the breakup of AT&T into the “Baby Bells”, which occurred in 1982. The first company to hit $10 billion in market capitalization. The 1950s were the golden years of growth for U.S. auto companies like GM and Ford, taking place well before the mass entry of foreign companies like Toyota into the domestic automobile market.